Start with a whimsical, fairy-tale landscape of hoodoos, ravines, valleys, and crazy rock formations. Add in a series of 2000-year-old underground cities, places where Christians took refuge during times of war with the Arabs, Persians and Romans. Sprinkle throughout the area 1000-year-old frescoes painted inside churches carved into the sides of cliffs. Put all three together, add in a giant volcano, hot air balloons, friendly locals, mix in a delicious local cuisine, place it in the Middle East, and you have one incredible travel destination. Quite simply, you have Cappadocia. We visited a claustrophobe’s nightmare at Kaymakli, an underground city used as a refuge by Christians during invasions by their enemies. The underground city, one of 200 in the area, was dug by hand and goes down eight stories through narrow passageways, through homes, kitchens, wells, churches and prisons. The city housed thousands of people who lived underground for up to three months at a time. It must have been a miserable existence, but it was evidently the best option at the time. They did have several huge jugs for wine, which I’m sure was a necessity for mental health while in the darkness. 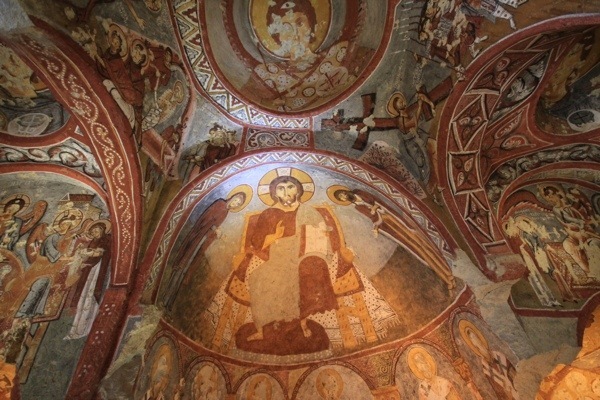 In the middle of this arid steppe, in churches carved out of rock, is something completely unexpected: dazzling, detailed frescoes painted over 1000 years ago. Most of the frescoes are in excellent condition, with vivid colors and exceptional details. For some reason, photography was permitted in only one of the many churches (see photo below). The churches and frescoes are part of the Goreme Open Air Museum about two miles from Goreme, the central town which most visitors use as a base. Standing in the churches, I tried to imagine attending church in a cave back in the day. Then I was elbowed by tourists pushing through to see the frescoes and such imagining had to cease. The rugged terrain in the area is ideal for outdoor activities like mountain biking and hiking. I loved Cappadocia but my legs hated it. We hiked about 30 miles in 4 days and my legs are still tired. Several trails leave right from Goreme. We hiked Rose and Red Valley, Pigeon Valley and Love Valley, so named for the phallic rock formations. Aside: The locals call them “chimneys;” the technical term is “hoodoo,” but the less mature call them “penises.” (Full disclosure: I refer to them as penises.) There are two “Love Valleys” in the area. I asked an Australian guy, who is living in Goreme, which Love Valley he’d recommend. “I prefer the short, fat penises me-self,” he said. We didn’t take his advice, and instead headed out to the other Love Valley with longer rock formations. We enjoyed our Love Valley. To each his own. To add one final touch of magic to Cappadocia, each morning hot air balloons take flight over the surreal landscape. On day one, as we drove to Goreme at sunrise, about 50 hot air balloons soared overhead. It was a stunning display, with huge, scattered, ominous clouds creating dramatic light play, as sun rays illuminated the balloons and rock formations while casting dark shadows across mountain peaks and valleys. Another morning while watching the sun rise, I saw one pilot, who was obviously very skilled, drop his balloon down in a valley and rise up through the hoodoos within a few feet of me. I could have jumped onto the balloon James Bond style and rode along for free, but I chose not too. Note: I would never ride a hot air balloon. As awesome as it would be, I have a crippling fear of heights. My fear of heights isn’t the real issue. The fact that I would certainly fall to my death is the real issue. There is no way around it: I would fall out. Small holes called dovecotes were carved into the soft rock to attract pigeons. Mount Erciyes, the highest peak in central Turkey, stands sentinal over Cappadocia. A home in the Kayseri Underground city. Christians took refuge from invaders in these massive underground cities several times over the course of history. Kristi crawls through one of the claustrophobia inducing passageways in the underground city. Sunset over Goreme in Cappadocia. Beautiful but hardly magical. The honeycombed castle of Uchisar overlooks the entire area. Many boutique hotels have moved into the caves, creating a bit of modern chic among the ancient ruins. A hot air balloon rises from a valley above Cappadocia. The better pilots can take passengers down into narrow valley then up high for excellent views. A vantage point from the “Rose Trail” above Goreme. This part of the trail offered stunning 360 degree views of Mount Ercycles, Uchisar Castle and the colorful valleys below. The Red Valley Trail leads to a few rock cut churches and past awesome rock formations. The best way to view the intricate and well preserved frescoes painted on the ceiling of the rock cut churches. Excellent! Good start to the trip? And are your legs still tired? The yes was in response to “our your legs still tired.” We’ve had a great start to the trip – Turkey was great. You’d love Cappadocia – tons of outdoor activities and very photogenic. Excellent. Sounds like you are done with Turkey then. I just got my computer set up last night. Trying to quickly edit 1500 pics from the 23 day drive from AK to CO before I head to Ecuador. AMAZING pictures Jeff. Tell Lady Bell I said hi! Just told her. 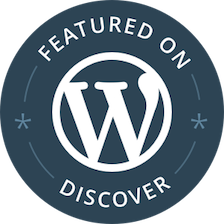 You need to update your blog! I like hearing about your experiences in Guyana. I am sure you are busy though. Amazing pictures of Cappadocia! I wish I had more time in Turkey last January to visit this place. But your pictures assure me to go back one day. I want to go back to eastern Turkey. I didn’t get enough time in the country. If you enjoy outdoor activities and photography, Cappadocia can’t be beat. Great Pics! I was in cappadocia 1.5 years ago and absolutely loved it! It is a great place – perfect for me because I love hiking. These are photos are gorgeous. Thanks for sharing! Cappadocia is really cool. It is handling the influx of tourists quite well. There are boutique hotels and chic restaurants, but right off the main streets people still live an old-fashioned life. It is one of my favorites.